Aaron Jay Myers cracked open a beer from a cooler in the back of Boston Sculptors Gallery (an old brick commercial building on Harrison Ave.), and nodded up to newcomers to the group, introducing himself as the first composer of the evening. Across the room, Matt Sharrock and Amy Advocat were already preparing the stage, although, stage may be too strong a word. 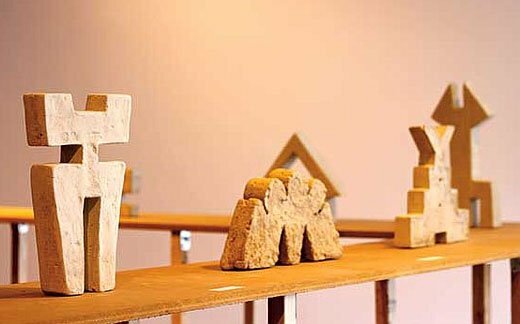 A shelf of ceramic sculptures in the middle of the room served as the focal point Friday; there Kalimah Muhammad’s “Journey,” a minimalist concrete and wood exploration asks what one is willing to give up in order to gain some personal alterations. The Transient Canvas duo set up around it. Advocat drank from her kombucha bottle and tested her reed as Sharrock joked over his shoulder about the beer in the back of the room, testing his mallets all the while. In the informal atmosphere, seriousness of the music never wanted. Two friends set up their instruments in a room full of more friends, gathering around to listen to boundless sounds. 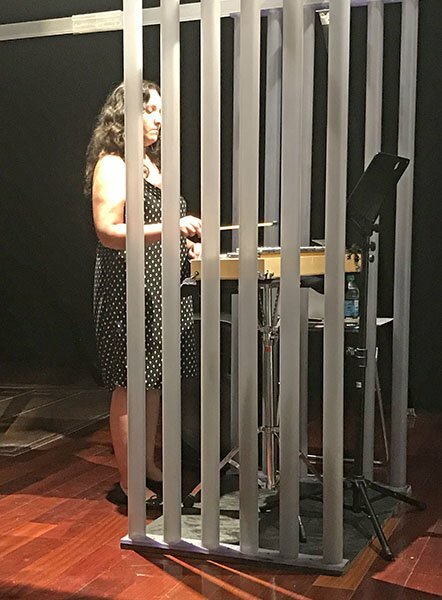 Unceremoniously, the concert began, the duo still testing his mallets, blowing into her clarinet, and about five seconds later: “And that was Aaron’s piece,” prompting rambunctious laughter from the group. After this, Transient Canvas played Myers’s piece, Have-Not, a contrapuntal, energetic, inquisitive, polyrhythmic set, influenced by the Illinois band Blue Meanies, jazz, and African music. Myers’s compositions always provoke deep thought, and Have-Not arrives with no exception: the interrupting nature of the piece collides with a sense of searching and, as the title suggests, not having. Osnat Netzer’s Untarnished Lucidity crashed in next, the first piece ever written for the duo. Moments of romanticism and clarity on the clarinet met lengthy marimba runs, sometimes contrapuntal, mostly conversational, occasionally swapping two separate conversations at once. Nezter described her work, “Eric Dolphy runs become a Bach toccata, becomes a decadently ornamented Brahms sonata, all the while one instrument wishes to give the other the space and the stage to be true to its nature and idiomatic sound world. Marimba wishes not to Mar the Clarity of the Clarinet. Not to Tarnish its Lucidity.” Although the piece itself is sporadic, it felt well-worn and incredibly comfortable in performance. Advocat pointed to Stefanie Lubkowski across the room, recalling that the two had watched a film called Decasia together, which oftentimes inspired this piece on the performer’s side. Lubkowski’s Right now, in a second felt like a wave. It faded and disappeared, then reappeared, alluding to the disintegrating photos of Decasia that Advocat mentioned. Featuring bowed marimba, brushed percussion, and clicks and blows of the clarinet, Lubkowski’s piece offered debilitating, staggering contrasts, though a fair match for the likes of powerhouse Advocat and steady-handed Sharrock. The duo does not shy away from extended techniques and experimental sounds; instead, they invite new sounds, fearless and unapologetic. Keith Kirchoff’s Monochrome ended the second half, another piece that sounded like a well-worn glove to the duo. The second half moved the audience to the other side of the gallery, featuring Murray Dewart’s “Dickinson Gate” from his “Spirit Level” collection, a 12-feet high structure made of translucent tubing resembling stainless steel. The gate acts as another play on journey and passage, following Muhammad’s theme. De la Guardia related how this performance felt very important to her, alluding to her Cuban background, convincing the audience that the westerns, cowboy stories, and outlaw stories felt like her childhood. She sang full of wide tones and different colors, all within the same motivic gesture, fearless and edgy in her approach. More performance art than art song, Dirty Paloma’s presentation touched on sensitivity, un-comfortability, and magical realism. Mixed feelings filled the room, a bizarre feeling of not knowing whether to love or hate the presentation. One of two events on Friday on the Boston New Music Festival, Juventas’s presentation of Transient Canvas and Dirty Paloma intrigued, full of emotional, thoughtful, experimental sets. Most importantly, the night centered on friendship, stressing the idea of artists who love artists. Rachael Fuller is an administrator at Massachusetts Institute of Technology who studied piano and music theory. By night, she is a practicing musicologist and concert enthusiast.